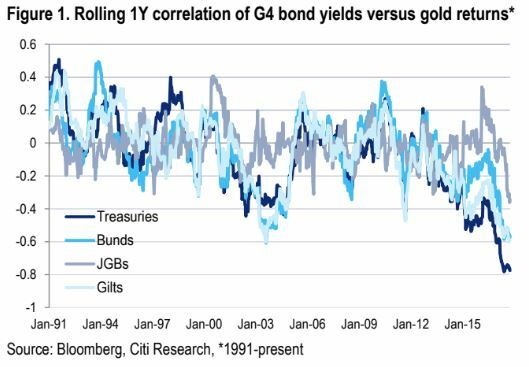 This week, we witnessed the largest breakdown in gold – rates (bonds) negative correlation in some time. 10s (US ten year Treasuries) – have rallied 2.39 to 2.31% with gold off 2.5%. For a big change, its been rates DOWN, gold DOWN in recent days. In recent years, the negative correlation has been as high as 81%, but this week it’s positive. For the last 24 months, the consistent trading pattern has been gold UP with bond yields DOWN (see the dark blue line above). A very steadily high – negative correlation. The latest developments are causing some disruption in the quant and macro hedge fund space, some participants are tinkering with their models to adjust for this possible regime change. The total amount of gold above ground is 190K tonnes or $6Tr at current value. Half of that is in jewelry so left with $3Tr. Half of that is in reserves at central banks so that leaves a physical gold market size available to investors of $1.5tr (excl derivatives). Today, total cryptos are remarkably 23% of gold liquid (physical) market capitalization. The total value of all cryptocurrencies out is now $350bl of which bitcoin $250bl. So cryptos are 23% of physical gold available to investors now.